The Marine Mammal Center : Dawn Junior Wildlife Champions! Seeking to deepen its commitment to wildlife, Procter & Gamble’s Dawn brand has recently launched its Junior Wildlife Champions program, a wildlife education and activity program aimed at educating 1 million children in grades 3-5 by the beginning of the 2011-12 school year. In conjunction with its long-standing partners, International Bird Rescue Research Center and The Marine Mammal Center, Dawn collaborated with Discovery Education to help provide teachers and families with new in-class lesson plans and at-home activities. The lesson plans are available in English and Español and teach children about the importance of helping to preserve wildlife and encourage them to get involved in their own ways. “As an organization that encourages the public to participate in the efforts to conserve and protect marine mammals, we applaud Dawn’s Junior Wildlife Champions program and encourage parents and teachers to get involved with kids using the lesson plans and home activities on the Discovery Education website. The Marine Mammal Center has always believed in the power of our youth to make change and is honored to work with Dawn to educate and inspire the next generation of ocean stewards." The downloadable lesson plans also bring newsworthy topics to the classroom and home and are available to educators and parents at Facebook.com/DawnSavesWildlife and at discoveryeducation.com/dawn. Throughout the program, three Junior Wildlife Ambassadors will be spotlighted for their individual efforts above and beyond to become involved in wildlife issues and embody the qualities that personify a true Junior Wildlife Champion. These youth ambassadors offer a child’s perspective on how education influences their wildlife point of view and resulting preservation actions. Click here to begin your exploration and become a Junior Wildlife Champion! 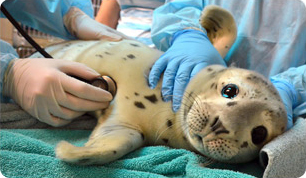 Click here to learn more about oil spill response and marine mammals and how you can help! Begin your learning adventure on Discovery Education!